Medyo late na ako nakadating dahil sa biglaang errands, but when I got there, on time naman pala ako ---On time for lunch! Hehe! I love the soup! Went back sa buffet table several times for this, haha! Dined and got to know the other bloggers. 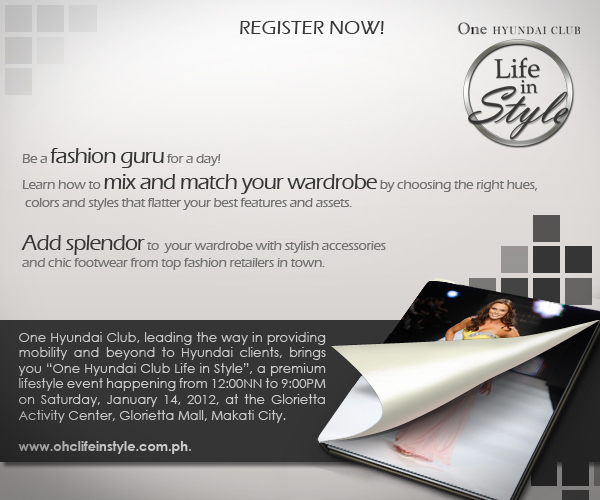 Narealize naming kakaibang mix of bloggers ang kinuha ng Hyundai for this event. I really find this interesting. Nice to meet different bloggers din of different niche pa: May travel, lifestyle, and tech! Cool bunch! As much as I love the exteriors, I fell even more in love with Hotel Celeste's interiors. Ang cute ng lugar, heavenly nga! A little getting-to-know-you segment, walang kamatayan! ;) Hehehe! To welcome the New Year and celebrate the first-year anniversary of the One Hyundai Club (OHC), Hyundai Asia Resources Inc. (HARI), the exclusive distributor of Hyundai vehicles in the Philippines, opens its doors for everyone to experience how it feels to become a Hyundai Customer through the One Hyundai Club Life in Style Event. Happening on the 14th of January 2012 at the Activity Center of Glorietta Makati, the event is HARI’s way of thanking OHC members for their support throughout the year, as well as sharing the modern premium motoring lifestyle that Hyundai motorists are enjoying all over the world. This is just the fashion part! To totally experience the One Hyundai Club luxurious lifestyle, they also prepared activities like indoor wall climbing for the sports enthusiasts, secrets to gourmet cooking from seasoned chefs, fun art classes for the kids, virtual reality gaming sections, beauty makeover segments, photography lessons, and photo booths! Love the gifts from Hyundai's partner merchants! Thank you Cocomo Clothing, Schutzen Notebooks, Clever Cats Int, Hotel Celeste, Luxure Ville, Bioessence, and Boracay Tropics! Congrats to sir Raffy Pedrajita of Digitalspidey.com for winning the Hotel Celeste accommodations! Hi Anna, ganda ng post mo. Slated for next week post yung sa akin. Nice meeting you at the Hyundai Bloggers Lunch. Love the first time event experience and the new found blogger-friends.